Batch file scripting goes all the way back to the time when MS-DOS was released in 1981 as an operating system for IBM personal computers. It was basically a clone of Digital Research’s CP/M, one of the very first operating systems for microcomputer. Microsoft made it run on IBM PCs acting both as kernel and shell along with some additional features of other shells. Microsoft released several versions of DOS over time subsequently extending the batch files in many ways. Then comes Windows which quickly evolved from an application to a full-fledge operating system. Microsoft included a command line interpreter called “Command Prompt” (or “cmd”) in its Windows NT line of operating systems which used basically the same commands of the Command.com but with additional features. On contrast to the earlier versions which would only allow a .BAT file to be run in the MS-DOS prompt, this enhanced 32-bit command line interpreter made the batch language more useful owing to the many enhancements and additional features. However, the command line interpreter was not able to provide consistency because they could not be used to automate multifaceted functionalities of the graphical user interface. It wasn’t powerful enough to satisfy power users. So, Microsoft started working on a new approach to command line management and finally released a new improved CLI called “Monad” in 2002. It managed to get over the shortcomings of its predecessor. By 2005, Microsoft already released three versions of Monad. In 2006, the name was formally changed to “Windows PowerShell” which bid goodbye to the old-school batch file scripting. Command Prompt or cmd is the command line interpreter for Microsoft Windows operating systems used to automate various system related tasks using scripts and batch files. Often referred to as cmd.exe, it’s a windows program that issues commands to the system like file management commands such as copy, paste, and delete. It emulates most of the command line abilities available in MS-DOS through a command line interface. It was initially released as the command line interpreter (CLI) for the Windows NT family of operating systems and was developed by Therese Stowell. CMD have built-in commands to execute various tasks, most of which can be executed as an administrator. Command Prompt can be accessed through its shortcut located in the Start Menu or via the cmd Run command. It is available in almost all versions of windows. PowerShell is a more advanced version of the cmd used to run external programs like ping or copy and automate many different system administration tasks which are not accessible from cmd.exe. It’s quite similar to cmd except it’s more powerful and uses different commands altogether. It’s more than just a shell; it’s a scripting environment designed specifically for system administrators to perform administrative tasks on multiple operating systems. It’s a task-based command-line tool and scripting language built on the .Net framework. It invokes a very rich set of commands within the context of automation scripts called “cmdlets” which enables administration in windows systems. They are also easy to use with standardized syntax which makes them easy to create powerful scripts. It’s a much powerful command line interpreter than the Command Prompt which can interpret both Batch commands and PowerShell commands. Both cmd and PowerShell are powerful command line tools used to automate system administration tasks by writing a script/batch file. However, cmd has limited administration capabilities as compared to PowerShell, which, on the other hand, is a more advanced and modern shell implementation with additional features and enhancements. PowerShell is specially designed for system administrators to control and automate the administration of windows systems. PowerShell is mostly used by system administrators to manage the network as well as the systems and applications that are part of that network. It can efficiently interpret both Batch command and PowerShell commands, whereas cmd can interpret only Batch commands. 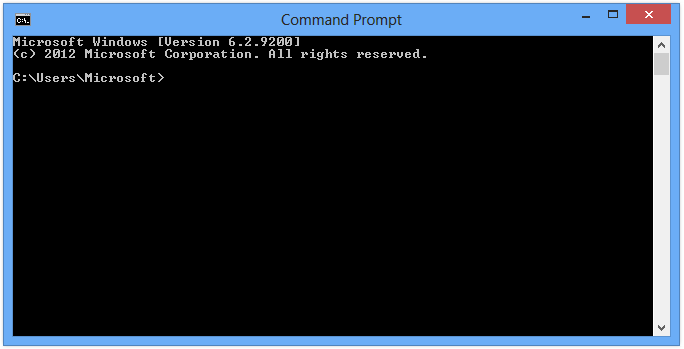 Command Prompt provides a means of interacting with the computer program with the help of user-issued commands. Unlike the Command Prompt, which can only pipe streams of text, the output generated from a cmdlet is more than just stream of text; they pipe objects between cmdlets which allows them to share more complex data between cmdlets. 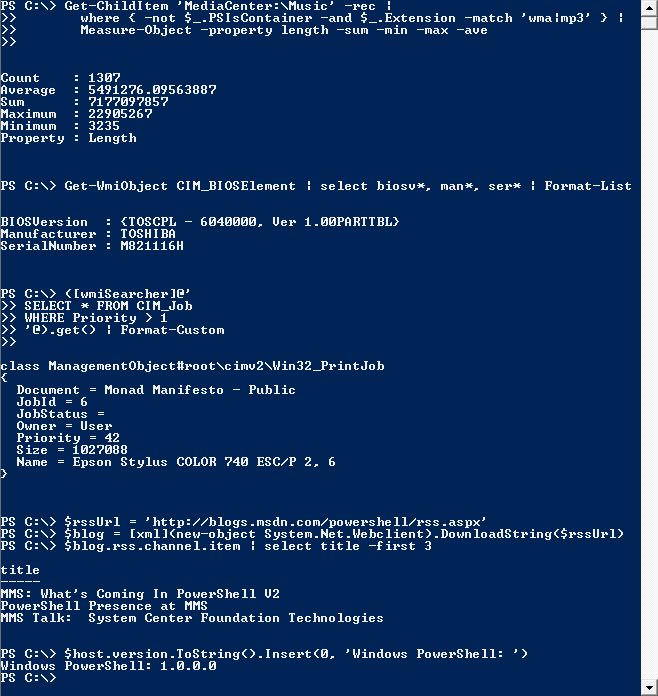 PowerShell uses much more powerful functions called “cmdlets” which constitutes a rich set of commands to execute more powerful queries with better output than found in the Windows command line. The functions of PowerShell are much more complicated yet powerful than the traditional Command Prompt and they very well can be used with the standardized syntax. PowerShell is more than just a shell; it is a powerful scripting environment based on the .Net framework that can be used to run complex scripts for windows system administration more easily and efficiently than it would with Command Prompt. Additionally, PowerShell includes several enhancements and additional features that extend its use which eventually improve its usability. 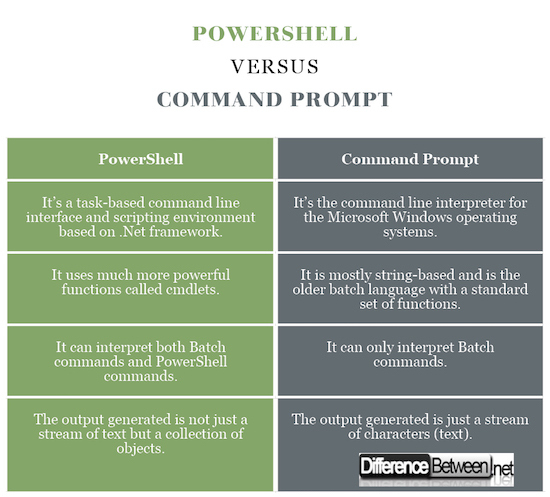 Both PowerShell and Command Prompt are task-based command line tools used to rapidly automate system administration tasks, but there are significant differences between the two in terms of functionality and usability. CMD is a basic command line shell introduce with the Windows NT family of operating systems with the same standardized syntax and functionality as DOS. PowerShell, on the other hand, is a task-based command line shell and scripting language based on the .Net framework used to automate batch processing and create system management tools. Unlike cmd, it uses a rich set of commands called cmdlets to carry out system administration tasks. Sagar Khillar. "Difference Between PowerShell and CMD." DifferenceBetween.net. April 5, 2018 < http://www.differencebetween.net/technology/difference-between-powershell-and-cmd/ >.